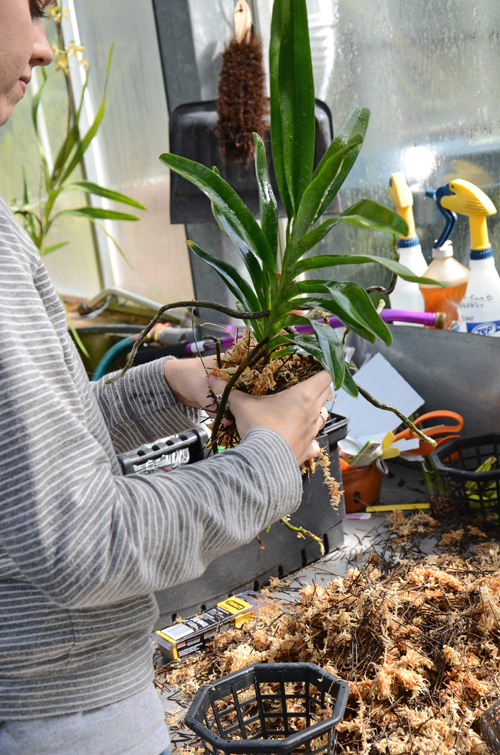 There will come a day in late spring when it feels like nearly every plant in our collection needs repotting right now and I start to feel like a cook in a busy restaurant on a Saturday night, plating at full tilt, my hair in flames. But we're not there yet. It's early. 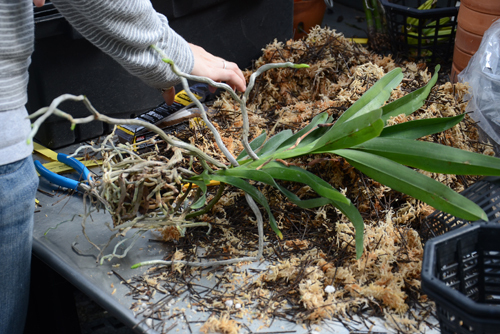 A few orchids --the ones that flowered in late autumn and early winter-- are starting to stretch out some tentative root tips. They're just asking to be repotted. 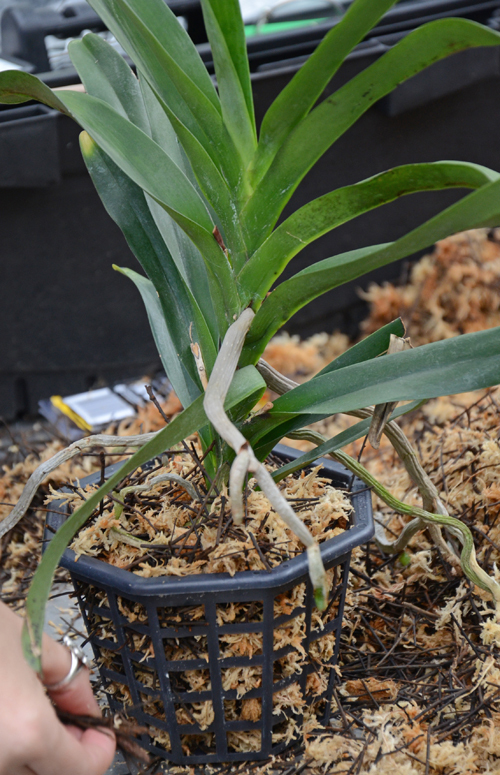 If you stopped by in December you may remember Angraecum sesquipedale, Darwin's Orchid aka the Star of Bethlehem Orchid. We have a dozen young plants that we purchased a year ago from Kalapana Tropicals. 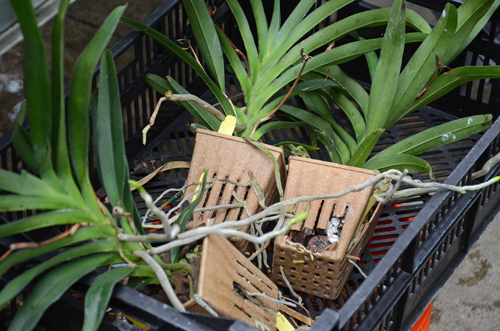 In a year or so we will install them in the Madagascar bed in the Orchid Display House. Right now we are repotting them. Pull up a chair if you would like to watch. Our plants arrived in pots made of biodegradable rice hulls. I like these pots--they are nicely proportioned, have terrific drainage and show no sign of breaking down after numerous waterings. Unfortunately at present they are only available directly from the manufacturer and with a dauntingly large minimum order (in the thousands). 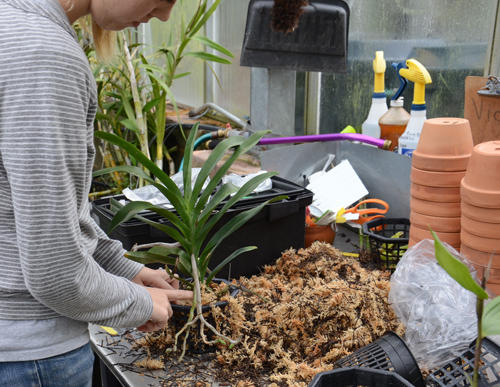 Hilary, our Assistant Horticulturist, breaks the pot (above) in order to extract the plant without damaging the roots. 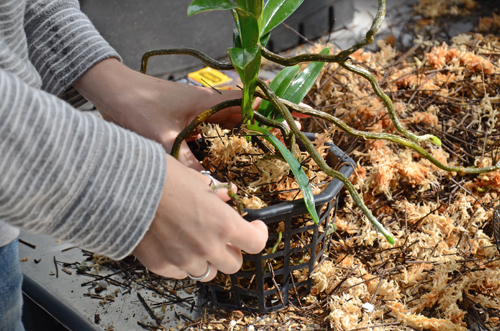 Next, she removes the old mix --a bark+charcoal+ perlite mixture-- from around the roots. Angraecums love this classic orchid mix. But we are going to change the mix because we are changing pots. Bath time for our orchid. 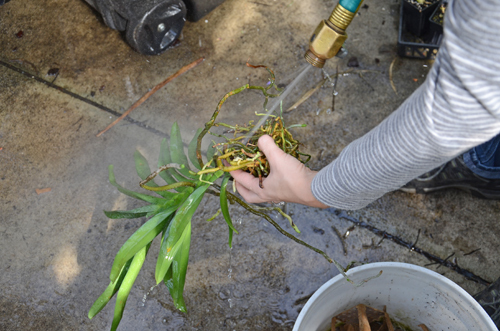 Washing the roots accomplishes two things: it removes the sludgey remains of the old mix; and it allow us to see the roots better. 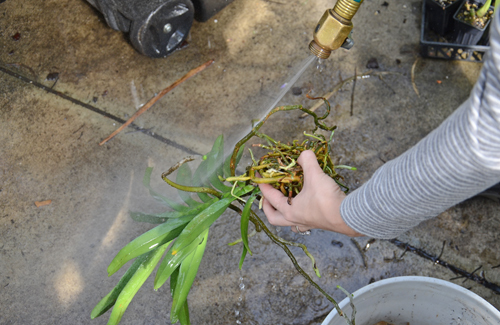 Next, Hilary directs a sharp stream of water at the lower surface of the leaves to remove a few scale insects. I'm happy to see a healthy root system with firm white roots and green root tips. Brown mushy roots are removed with a razor blade. 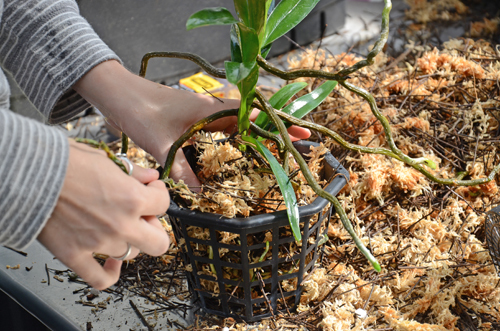 Losing orchids in solid plastic pots to root rot during Atlanta's long sweltering summers has taught us the value of net pots and open baskets for greenhouse use (but definitely not for windowsill use). In these pots a mixture incorporating long fibered premium sphagnum works well because it doesn't sift through the drainage holes. 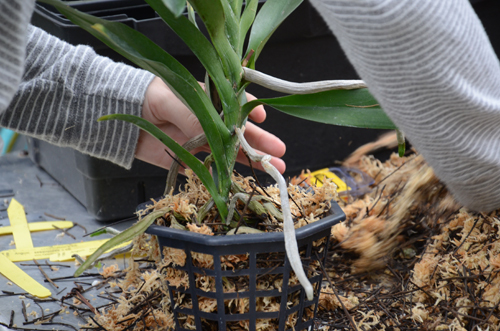 We add a little coarse tree fern fiber to give Angraecum sesquipedale the extra aeration it needs. 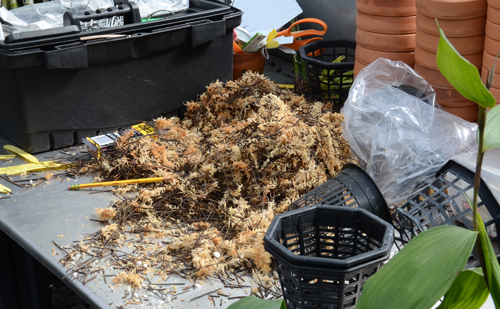 This sphagnum+tree fern mixture is just one of three main orchid mixes that we use. 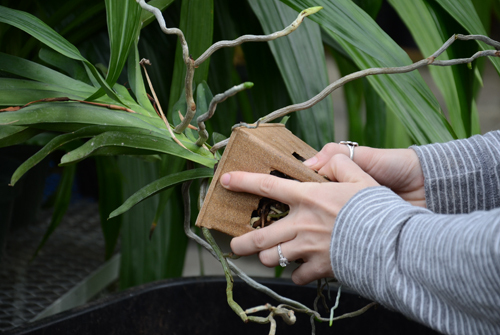 Hilary holds the plant with one hand and uses the other to wrap the root ball loosely with the moss mixture. Working with this mixture can feel a little strange at first when you are not accustomed to it-- like creating a bird's nest. But it's really very easy. 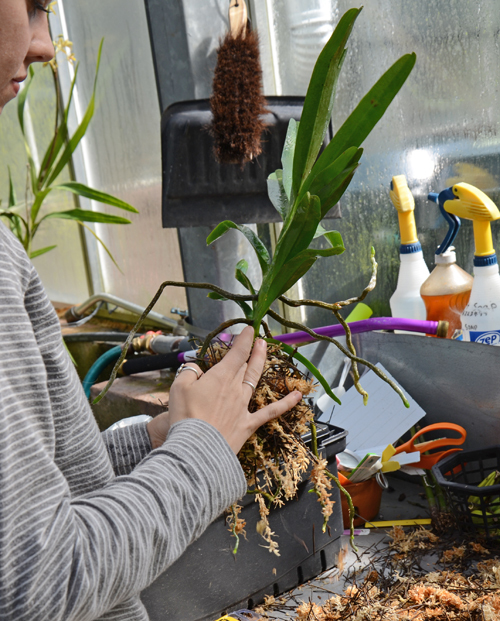 Hilary is being very careful to hold the plant gently so as to not break the root tips. When she has created a mass about an inch smaller in diameter than the pot, she lowers it into the net basket. 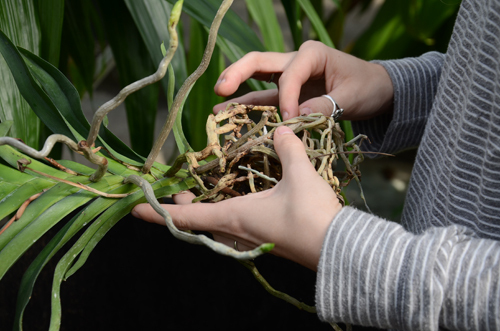 Notice that she hasn't tried to force all of the aerial roots into the basket. 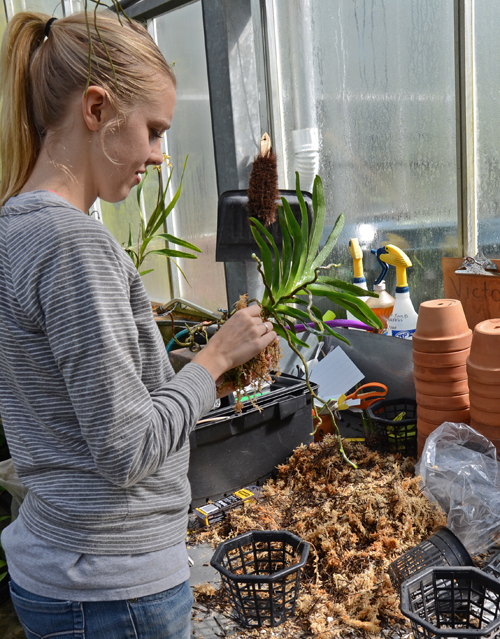 Hilary then adds small amounts of mixture between the roots and pot until the plant stands upright. It's important to not pack the roots too tightly. Small air pockets are okay. The moss mixture will last about two years if it is not over-fertilized or over-watered. Nice job, Hilary. Thanks for the info! It looks like Hilary really knows her stuff.